Let’s face it: cyclists tend to get big butts. That can be a fashion problem for some of us. It can also cause some pinching and pressure that results in serious aches and pains. For me, I’ve noticed that a lot of biking can cause pain in my sciatic nerve, especially on the right side (my stronger side). Basically, it’s because my glutes are getting bigger and the muscle is pressuring the sciatic nerve. The pain often extends down the back of my right leg. I find I can get some relief from self-massage — more technically known as myo-fascial self-release. Basically, it means sitting on a foam roller and rolling back and forth on my glutes. 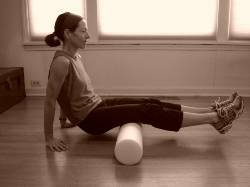 It’s a little painful to start with but it quickly loosens and relaxes the muscle. That, in turn, relieves the pressure on the sciatic nerve. I’m sure it would be a lot more fun (and probably more effective) to hire a professional masseuse but this is the cheap, easy way to get similar results.